But the animal let out a series of ‘hee-haws’ and unfortunately for the trio alerted nearby police. CANADA – One person’s crime in progress is another person’s hamster invasion, say Royal Canadian Mounted Police in Coquitlam, who are reminding callers how to use the 911 emergency line. Const. Jamie Chung says some calls to 911 aren’t an emergency at all, like the angry man who called after buying a hamster that gave birth to a litter of 10. He says the man was upset because the store refused to give him a refund and his next call was to 911. Chung says the call-taker explained the 911 line isn’t there to settle consumer disputes and talked the man out of dropping the hamster brood off in the Mounties’ parking lot. The officer says emergency operators have taken calls for everything from chickens crossing the road to bad pizza and even a sasquatch sighting. He says people need to remember that calling 911 is for emergencies only, such as crimes in progress or where people or property are being threatened. 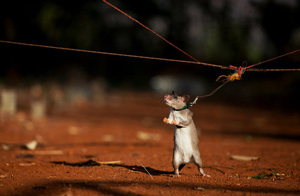 A baby rat in a tiny harness twitches its pointed nose incessantly, probing a field where it is being trained by a pioneering Dutch Non Governmental Organisation in Tanzania to sniff out deadly landmines. Other rats trained under the same scheme have already helped clear large swathes of land in neighbouring mine-infested Mozambique. From London’s Daily Telegraph and British Columbia’s The Providence.